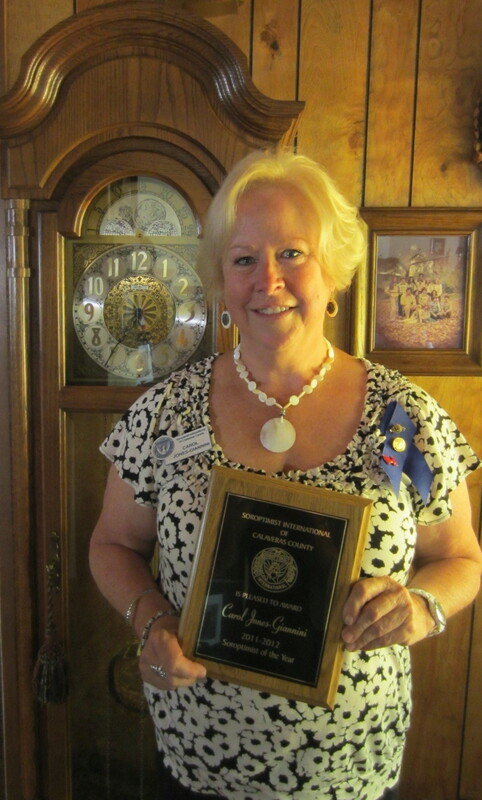 Honored during the annual installation of officers in June 2012, Carol Jones-Giannini received the prestigious Soroptimist of the Year award. This honor is voted upon by all members as they reflect on the achievements of Soroptimist members who have gone above and beyond the call of community service. The member chosen demonstrates leadership ability and often seen heading SICC’s fund-raising events. Carol was chosen for her leadership and creative talents involved in the club’s annual Teddy Bear Tea, for which she has been co-chair for the past two or three years. She has, also, served as a director for SICC for the past two years and was an active committee member for the club’s Chili and Cupcake event held in May 2012. Carol’s personality and contagious smile can seen from across the room. Carol is always willing to lend a hand and her creativity and ingenuity is unsurpassed. She gives without reservation and her “can-do” attitude shines through in all projects where she is involved. Positiveness is her strong suit and she truly is deserving of our most coveted award. Crissy Huey of Angels Camp was honored June 1st as Soroptimist International of Calaveras County’s 2010-2011 Soroptimist of the Year, during the club’s June meeting and Installation of new officers ceremony. 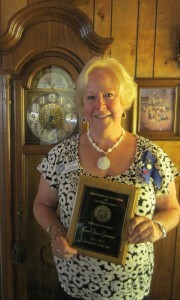 Soroptimist of the Year is the greatest honor bestowed upon a member. She lives the Soroptimist ideals in all that she does. She believes that by joining together and working together we can make this world a better place. The award signifies a love and dedication to the Soroptimist mission of “Improving the lives of women and girls, in local communities and throughout the world”. As a new member (joining the club last June) Huey “jumped right in and gave it her all”. She has been involved in a wide variety of activities and fund-raisers: Desserts & Dancing (what a luscious display of desserts she created), Chairs for Charity – her Pampering Basket brought the most raffle tickets, she co-chaired the Chili Cook-off, was involved with planning the District III meeting, Teddy Bear Tea … and the list goes on. Congratulations, Crissy for being honored with this prestigious award.